You see this crock pot full of yummy stew? 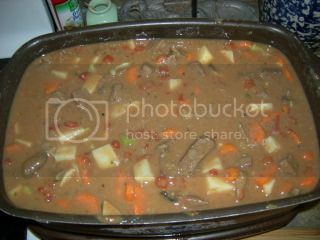 It’s filled with chunks of tender beef and loaded with yummy vegetables like potatoes, carrots, mushrooms, and tomatoes. I put this meal together before we left because I knew I’d be too tired to cook even a simple meal after a whole day out. I actually thought about the stew several times throughout the day and was almost anxious to get the field trip over with to get home to what is one of my favorite meals. I didn’t smell it cooking when we all trooped exhausted through the door around 4:30 Friday afternoon. Somewhere in my mind I thought that was a bit odd but I didn’t go upstairs right away. He got a spoon, opened it up and dug in. And, it was cold. 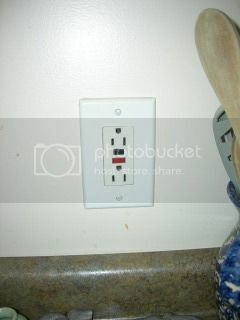 You’re thinking I didn’t plug it in, right? Nope. I plugged it in. Maybe the crock pot died? It is ancient and I’ve been meaning to replace it. But that’s not it, either. Safety plugs killed my stew. The little red button wasn’t pushed in. I think I’m growing as a person, though. There was a time that this situation would have really upset me. Don’t get me wrong. I was very frustrated. But in years past I may have even cried over the lost time, the lost food, the lost money. The lost money would have upset me the most because in years past things have been very tight. While we’re not where we want to be financially by any means we are definitely doing better. I owe a lot of it to good old Dave Ramsey. Thanks to his way of thinking we had money set aside to cover dinner.